Phil Mickelson may be regretting the fact that he has to share the US Open lead with fellow American Billy Horschel at the end of the second round at Merion, but that regret shouldn’t last long. Horschel carded a stunning three-under par 67 to join first round leader Mickelson on one-under for the tournament at the end of day two, and that looks to be a pretty good place to be given recent results. Whilst Mickelson might regret the bogeys on the 12th and 13th holes of his second trip around the course, his position as one of the top two players in the field is certainly a privileged one. Webb Simpson may have come from nowhere to card two 68s and make off with a first Major title at the Olympic Club in San Francisco last year, but prior to that all of the last five US Open champions had been in one of the top two positions at the halfway point. Rory McIlroy, Graeme McDowell, Lucas Glover, Tiger Woods and Angel Cabrera all had solid starts and maintained them to take the crown. Five-time runner-up Mickelson is the 4/1 favourite to claim a fourth Major title on what will be his 43rd birthday on Sunday. 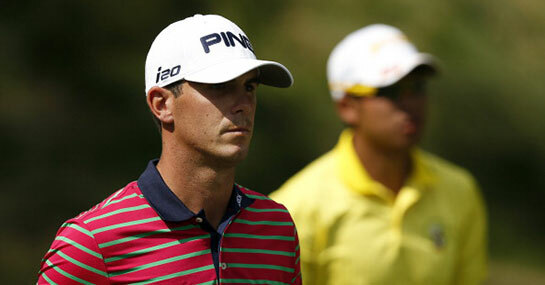 But having hit all 18 greens in regulation on Friday it could be Horschel, a winner on the PGA Tour as recently as April, who proves to have enough to claim a first Major title. The 26-year-old Floridian is still priced at a tempting 10/1 despite his second round heroics, when he was one of only three players to complete his round under par alongside Justin Rose and Steve Stricker. Rose and Stricker are priced at 7/1 and 12/1 to claim Merion glory respectively, whilst 16/1 Ian Poulter and the 100/1 Chinese Taipei amateur Pan Cheng-Tsung should also be taken seriously given that they were a shot off the lead when day two came to the close.